Apple Inc. has agreed to settle an antitrust lawsuit with class-action plaintiffs who claimed the computer giant overcharged e-cook customers by hundreds of millions of dollars. The settlement offer has not been publicized, and could still be voted down by the class-action plaintiffs. Last year, a federal judge ruled that Apple colluded with five major book publishers, creating a “cartel” to drive up e-book prices for the iPad. Plaintiffs in the antitrust class-action lawsuit sought $840 million in damages, claiming the computer company intentionally overcharged consumers by $280 million for e-books and that the company should have to pay three times that amount. Apple reportedly allowed book publishers to set their own e-book prices, with Apple keeping 30% of the sale. Plaintiffs allege that this practice drove up the cost of e-books dramatically, especially when compared with another e-book publisher, Amazon, a company that reportedly lost millions in the first few years of e-book publishing in order to intentionally drive down prices to gain a market share. The Department of Justice consolidated the antitrust class action in 2012, and the five major publishers have already settled with the DOJ. Although Apple has offered to settle the price fixing claim, paying the $840 million in damages would hardly hurt the company’s profits, and would most likely not eliminate price fixing in the e-book or electronic entertainment industry. Apple reportedly has at least $160 billion in cash. Antitrust laws are laws used to regulate anti-competitive behavior in business, as well as regulate unfair business practices. The government maintains these strict antitrust laws to limit the control of one business over the market. Essentially, the US government is preventing the formation of large monopolies. Antitrust law violations can happen to anyone. You do not have to have a big business to be charged with antitrust violations. What you may see as business negotiations between your business and another, the government may view these negotiations to be antitrust violations. If the government is investigating you or your business for antitrust violations, contact an experienced South Carolina criminal defense attorney today. Being found guilty of antitrust violations is no minor offense. Antitrust violations are felonies and could mean hefty fines and stiff penalties including imprisonment. 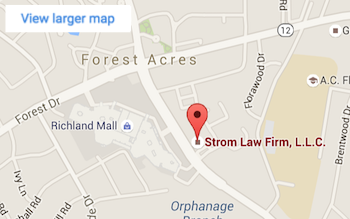 The Strom Law Firm LLC’s business litigation practice is focused on representing individuals, officers, directors, public companies, and private corporations involved in complex civil disputes.